Now, please don’t misunderstand: I have nothing but respect for Quaid for his brutal honesty about his self-destructive behavior. And I appreciate his tenacity and discipline, two sterling attributes I wish he could share with someone very close to me who’s been battling similar demons for decades. But I remain perplexed by the commentators who have expressed surprise and/or snarkiness while noting Quaid’s comments. While reading what some of these people have written, you’d almost think Quaid had never discussed this subject with anyone before, and was doing so now only as some sort of publicity ploy. The truth is, Quaid has been entirely forthcoming about his recovery while talking to the press for more than a decade and a half. Hell, he’s even talked to me about it – on several occasions, in various interviews since 1993. And he’s had to know that I’ve been reporting what he’s said: The first of those interviews appeared in his hometown newspaper, The Houston Post. Back when I was film critic for the Post, I covered a Los Angeles junket for Flesh and Bone – a 1993 drama for which Quaid should have received an Oscar nomination – and the Houston-born actor already was celebrating his third year of being drug-free. On the other hand, he left no room for doubt that there would be no backsliding. Especially not after the birth of Jack Henry, his son – 18 months old at the time of our conversation – with his then-wife Meg Ryan. “Let's put it this way,'' Quaid said. “I was living on the edge. And I decided that enough was enough. I come from a time -- the '60s, that generation -- when, to put it bluntly, drugs and alcohol were a lot of fun. And then fun with problems. And then it was just problems. “For myself, I had to just stop and take account of my life, and then sort of re-create a new life for myself. For over three years, I'm clean and sober now. And it's a brave new world, it's great. Ten years later, Quaid continued to sing the praises of the straight life while on location near Austin to film The Alamo . At the time, he was enjoying a career upswing that began with Frequency (2000) -- a time-tripping sci-fi drama in which he played a father whose fate is altered by his loving son – and continued with back-to-back successes in two 2002 releases: John Lee Hancock’s The Rookie , a surprise box-office hit in which Quaid played real-life baseball phenom Jim Morris, the oldest rookie MLB pitcher to take the mound in 40 years; and Todd Haynes’ Far from Heaven , a glossy melodrama that showcased Quaid as the repressed homosexual husband of a pampered ’50s housewife (Julianne Moore). The Alamo – which reunited him with Rookie writer-director and fellow Texan John Lee Hancock – turned out to be a critical and box-office bust. But Quaid earned a fair amount of praise for his vividly detailed performance as Gen. Sam Houston. And while making the film, he sounded very much like a man who was savoring every second of his second chance. “After I went through rehab for cocaine and whatever, there was sort of a hard road back for me. I had to scramble for jobs. I really wasn’t doing the kind of work that I wanted to do. Back in the late ’80s, studios were offering me all kinds of things. I was sort of the golden boy for, like, 15 minutes. And then, all of a sudden, it was all gone, all taken away. The last time we chatted, while I was preparing a 2007 cover-story profile of him for Cowboys & Indians magazine, Quaid still sounded like a happy camper – albeit one who remembered his time spent in the dark side of the woods. 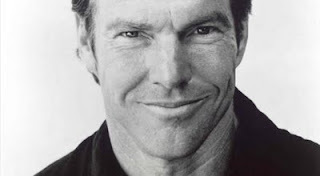 So I asked him: If he could take advantage of the weird science imagined in Frequency, and somehow travel back in time to meet the young Dennis Quaid of, say, 1977 – what advice would he give that young guy? “I would tell him to relax and take it easy,” he replied. “Have some patience. “But of course,” Quaid quickly added, “he probably wouldn’t take my advice. See, that’s the deal: We’ve all got to make our own mistakes. Youth is never inclined to listen to experience. Everybody has got to go through what they go through. Perhaps. Still, it would be wonderful if some people – if a lot of people – read Quaid’s Newsweek article, and took to heart the hard-won lessons he has to offer. As I said earlier, I greatly admire his honesty and resilience. And while I’m surprised that so many people seem to be surprised by what he wrote, never mind: Maybe some cautionary tales cannot be told often enough. 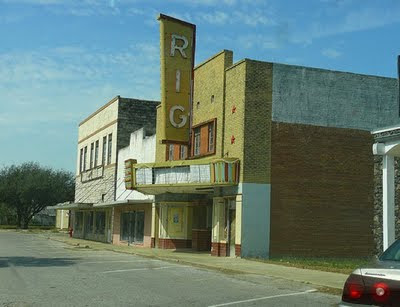 Every time I drive past a shuttered movie theater, my heart breaks a little. I think of the many people who had so many memorable times there. How many had their first glimpses of faraway places, or were inspired to be or do something, or had their assumptions about other people challenged for the first time, while gazing at the screen. How many families enjoyed -- without realizing until years later how much they treasured -- the times spent there as family outings. How many children felt safe, even when bad and scary things happened on the screen, because mom or dad or both parents were there to protect them. And yes: I wonder how many fell in love, or savored their first kiss, while seated in the darkness? Funny thing about Sidney Lumet: For all his outstanding achievements as a director, Night Falls in Manhattan (1996) is the only one of his films that I recall actually being hyped as "a Sidney Lumet film." Even in the trailers. Note how three of his masterworks are used in the above clip to publicize a film that more or less bills him -- not Andy Garcia or Richard Dreyfuss or any other on-screen talent involved -- as its real star. When people ask me what I think are my greatest accomplishments as a critic and journalist, I freely admit: I take enormous pride in the self-control I evidenced on two different occasions when I conducted one-on-one interviews with Helen Mirren -- just me and her, all alone -- in posh hotel suites. To my great credit, I did not throw myself on the floor and start sucking her toes. I did not attempt to pour honey on her thighs and start licking it off. I was, in short, a thoroughgoing, respectful professional. Some people, it appears, are not nearly so disciplined. Can't say that I blame them. Joseph Meissner wasn’t born in New Orleans – he’s actually a Houston native, and a Class of ’89 grad of Bellaire High School – but he got there as fast as he could. Indeed, he’d already been living in The Big Easy for four years -- along with his wife and artistic collaborator, Wisconsin-born Helen Krieger -- when Hurricane Katrina devastated the city in 2005. By that time, both Meissner and Krieger had established such strong ties to the Crescent City that they couldn’t be dissuaded by random acts of Gods – or long delays in urban recovery and renewal – from returning to live in their adopted hometown. Krieger, an author, eventually drew on her experiences and observations in post-Katrina while writing a short-story collection (In the Land of What Now ) that she later adapted into a screenplay. And Meissner, an actor, directed and starred in an indie movie taken from that screenplay, Flood Streets, which will premiere at 7 p.m. Monday as part of WorldFest/Houston International Film Festival. You can read my CultureMap interview with Meissner here. In tribute to the late Sidney Lumet -- a chronically underrated filmmaker with an incredible number of great films to his credit -- I have just posted an excerpt from my 2007 master's thesis on the New Hollywood Era that focused on Lumet's Serpico . This posting certainly will not be my last to acknowledge Lumet's extraordinary career. But I wanted in some way to offer my respects on a day when all lovers of film should respectfully note the passing of a master. 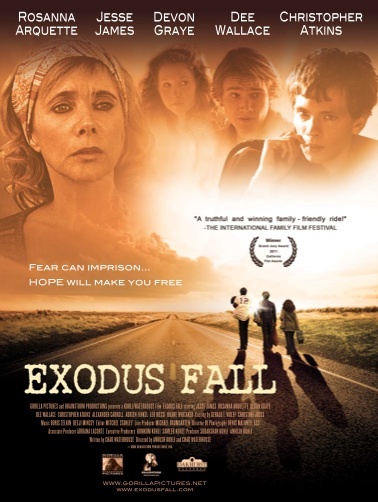 At least one nationally recognized film critic has great things to say about Exodus Fall, Friday's opening-night attraction at WorldFest/Houston International Film Festival. In today's edition of the Los Angeles Times, veteran reviewer Kevin Thomas describes the "sensitive, highly appealing drama" -- which opens theatrically Friday in L.A.-- as a "graceful, easy-to-take picture" that serves as "a nifty example of resourceful independent filmmaking, with a perfectly blended ensemble cast in well-drawn roles." The drama, a '70s period piece about three Texas teen-agers who flee their abusive mom (Rosanna Arquette) to live with their grandmother (Dee Wallace Stone) in Oregon, was co-directed by screenwriter Chad Waterhouse and producer Ankush Kohli -- filmmakers praised by Thomas as "skilled storytellers with a sure sense of structure, a deft way with telling detail and with capturing the exuberant sense of freedom and joy the siblings experience during their journey." Dennis Harvey of Variety, the showbiz bible, is a tad more restrained in his praise, noting that the film contains "some stilted dialogue and crudely melodramatic moments," but is "nicely crafted and sweetly engaging overall," with "some poignant moments compensating for various flaws." 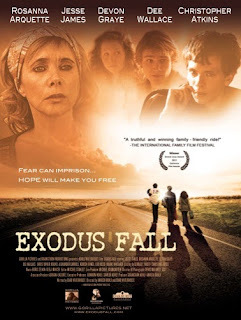 You can judge for yourself tonight when Exodus Fall unspools at 7 pm at the AMC Studio 30.